Voted “Europe’s leading city break destination” in 2009, 2010 and 2013 by WorldTravelAwards; Lisbon has become a major force in the tourism/travel industry. A rich history, strategic location, a beautiful blend of ancient and modern architecture, attractive weather and temperature, welcoming locals, and affordable; Lisbon has nothing to be shy of compared to other European capitals cities. 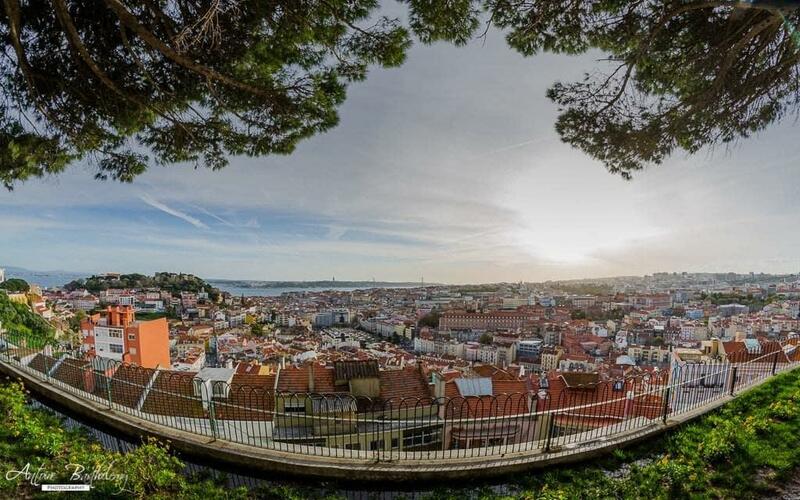 Dubbed the “Seven Hills”, the landscape of Lisbon has the advantages to offer magnificent panoramic viewpoints. Those viewpoints will offer a perfect panorama over one of the oldest city in Western Europe. You must include some in your portfolio when it comes the time for you to visit the capital of Portugal. I went out and collected the Top 10 for you, from a photography standpoint. Situated in the back street of Bairo Alto, this viewpoint offers a calm scenery over the Ponte 25 de Abril and the Tagus. Popular especially among the young bohemian crowd, a cafe invites you to sit and enjoy a fresh drink while admiring the view. Under the shade of the trees, miradouro da Graça offers a view of a “mass” of concrete buildings that seem to be the definition of what a “city’ represents. From here you can also appreciate the overview of many of Lisbon landmarks, including the Castelo de São Jorge and the Ponte 25 de Abril. For an undisturbed view of the endless streets of Alfama, Lisbon oldest quarter, descending towards the river. The view frames two of Lisbon landmarks; the Monastery of São Vicente de Fona and the Monastery of Santa Engrácia. The romantic terrace of this miradouro offers a superb view over the rooftops of Alfama and the Tagus. From here you can catch a glimpse of the dome of the National Pantheon. On a verge of Bairo Alto quarter, close to Rossio square, an upper balcony overlooks a charming garden terrace. Adding the numbers of restaurant and cafe, this place invites you to just sit and relax while looking at the top of Lisbon rooftops and the Castelo de São Jorge in the distance. Situated in Almada, on the other side of the Tagus, the view from the platform standing at 82m (270 feet), is immense. Standing right above the 25 de Abril bridge and capturing an overview of the whole of Lisbon at a distance, this viewpoint is a unique experience. The view from the São Jorge Castle is spectacular. From the terrace of this historic monument, you can see the 25 de Abril Bridge, the Tagus and almost the entire city. The crowd of orange rooftops seated almost on top of each other gives a good colourful signature of the city. One of the most iconic monuments of the city elevates you to the top of Baixa quarter. This neo-gothic elevator offers a 360° view that includes Rossio square and the Castelo de São Jorge that rises over the streets of Alfama. For 4€ (adult price), you can climb at the very top of this building built in 1960 to commemorate the 500th anniversary of the death of Prince Henry the Navigator. It offers a magnificent 360° view over Lisbon and beyond. The frame includes the Jeronimos Monastery and the Jardim da Praça do Império (Empire square in English), the 25th de Abril bridge, Belém Tower and Marina de Belém to name a few. This miradouro offers probably the best panoramic sunset of the city. Here you can catch a 180° view of the major landmarks of the city plus almost the entire city which seems to disappear into the clouds. And it’s free!